The Ootori Asuka A-600 is an affordable massage chair that surprises with features you won’t expect from its price point like 3 zero gravity positions, body scan, and adjustable shoulder and calf rollers. The commendable design and glowing customer feedback makes this chair highly recommended. Read our full review below. 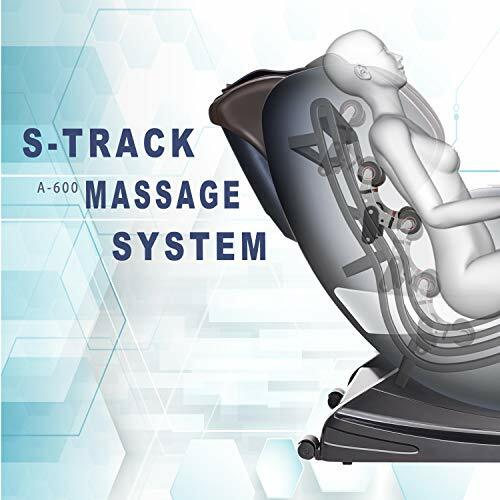 S-Track Design-Connecting with ergonomics, S-track aim to provide flexible acupoint massage for your neck, shoulder, back and waist area. Ootori has been in business for the past 20 years and has been selling massage chairs for the last 6. Their massage chairs are designed in Denmark and built and assembled in Shanghai. The Ootori Asuka A-600 has 3 years warranty. This warranty covers all labor and cost. They even do on-site repairs. However, you will need to make sure to register your purchase with Ootori within a month’s time to make sure that you can avail of the warranty. If you don’t meet the one-month grace period, it will void your warranty. Body Scan – The body scan feature makes sure that you get a massage that is tailored to your measurements. 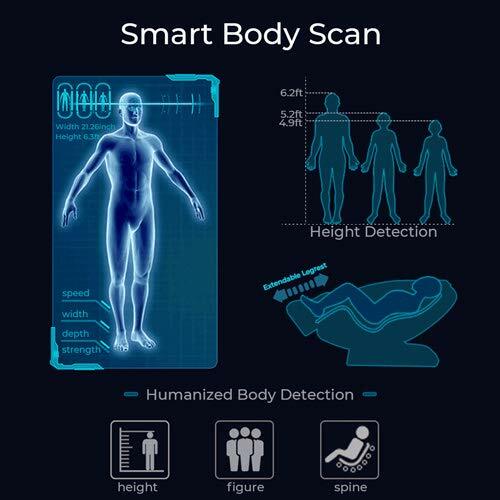 When you turn on the massage chair, it will automatically scan your height and shape. This will enable the chair to make adjustments and ensure that the roller massagers hit your neck, back, waist, and other body parts. S-Track roller massage – An S-track roller track follows the S curve of the spine. This assures that the dips and curves of your neck, back, and buttocks will be reached by the chair’s rollers. You can read about the different types of massage chair tracks HERE. 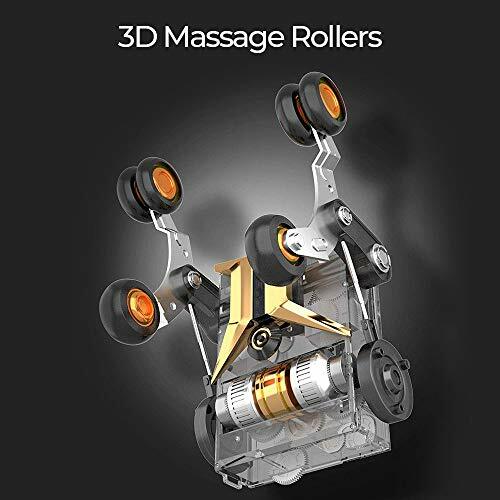 3D Massage Rollers – Rollers are the massaging mechanisms inside of your chair. Instead of just going up and down or left and right (also called 2D), they are also able to move in and out (hence the 3D term). As a result, 3D rollers give a deeper and more dynamic massage than 2D rollers. 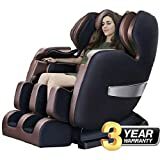 Full Body Air Massage – Apart from the roller massage, you also get a massage from a system of air bags inflating and deflating in strategic positions of the chair. Adjustable settings – There are 3 strength settings and airbag intensity settings you can choose from so you can adjust the massage according to your tolerance levels. 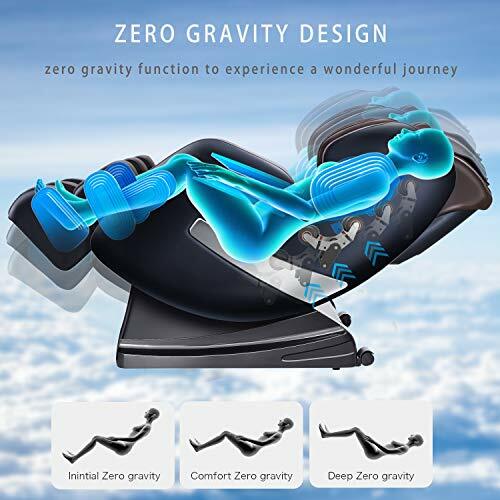 Zero Gravity Technology – This feature lets you lie flat on the chair with your feet on the same level or higher than that of your heart. This gives you a weightless and “floating” sensation. Lumbar Heating – This chair provides heat for your waist and lower back. Space-saving – You only need 3 inches of clearance from the wall in order to fully recline your chair. 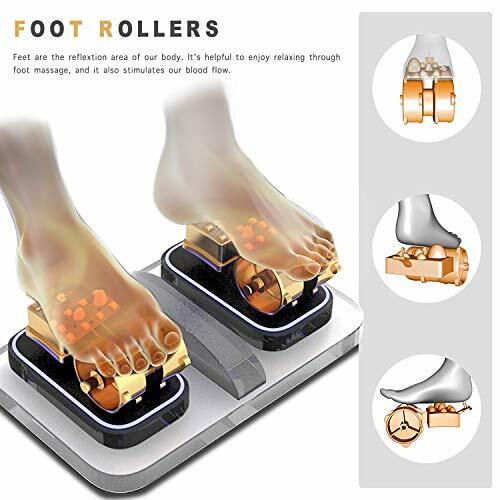 Foot rollers – The footrest is equipped with rollers that will massage the base of your feet. LED remote control – You can make all adjustments from the digital remote control. There is also a pocket where you can easily store and retrieve the remote. By looking at some specific features of this model, one can see how much thought the designers have put into accommodating users of different heights and body shapes. The electric massage rollers can be adjusted for different shoulder widths. The adjustments range from 4cm to 21cm. So, whether you are on the lean or big side, you will get a good massage from the rollers and airbags. The leg stretching feature allows the calves massage to be stretched up to 18 cm. This means that different heights can be accommodated. The first two are surprising features in a chair at this price point. We say surprising because even more expensive chairs don’t have this level of customization for different body shapes. It’s always a good thing when a chair has zero gravity. Not only does it sound fun being suspended in such a position, it has real benefits for one’s health. It is extremely beneficial for circulation. It also temporarily relieves the pressure on our spine thus decompressing it. A lot of our lower back pain is a result from being on our feet too much and our spines and lower backs bearing the brunt of our full weight. If you try the zero gravity position, you will feel immediate relief in your spine and lower back. The improved circulation is also particularly rejuvenating. With this model, Ootori goes one step further by having 3 zero gravity positions. They are initial, comfort, and deep. We would recommend the shallower recline first – initial – before going to the other levels to let your body adjust to this new position. The foot rollers on the Ootori massage chair are also surprisingly good. Normally, when we mention foot rollers in our reviews, it’s to talk about how strong or painful they are. This is not the case with the Ootori’s foot rollers though. They’re on point and give the right massage intensity. I have plantar fasciitis and the roller massage felt great on the soles of my feet. I previously brought a manual massager because I was on a budget, but an electric roller massage like this is also enviable. One buyer with heel spurs shared how the roller massage helped with his condition. Also, if you work on your feet all day, the roller massage on this chair would be perfect for you. Take note though that our thresholds are all different. I think the average person would find the roller massage on the A-600 just right. However, if you are on the sensitive side, you might find it a tad too strong. Assembly is usually a pain with massage chairs because they nearly always come with generally useless manuals. It’s a common complaint with massage chairs. With the Ootori, however, it comes fully assembled. I have to give kudos to the designers because they thoughtfully added wheels to the A-6000. An able-bodied person can wheel this in place single-handedly. However, if you are bringing this up some stairs or cannot carry heavy stuff in the first place, make sure to get White Glove service. You only need a mere 3 inches from the wall to be able to recline your chair fully. This is possible because the chair slides forward as it slowly goes to the recline position. Without this space-saving feature, you will need a bigger clearance from the wall and you’ll need to allot a much bigger space for your massage chair. The Ootori Asuka A-600 has very good reviews from its buyers. In fact, it has gotten perfect ratings from the people who have bought this chair, which brings us to the next point. You may not be aware of it but some manufacturers and distributors cheat by putting up fake positive reviews under their product pages. You can rest assured with this model and brand that the reviews are legitimate. We will be regularly monitoring the status of these reviews in the next few months. Priced at a little under a thousand bucks, we can still categorize this model as a budget chair. It’s not as cheap as some $500 massage chair that we’ve reviewed in the past, but the good reviews and customizable settings make it a good contender if you are shopping for a budget chair with core features. The chair gives off weak heat. This is a bit disappointing because heat on massage chairs is always something that we love. It helps with lumbar pain and is very comforting during cold weather. If you’ve been following our site, you know that we have some go-to brands. These are brands like Inada, Human Touch, and Kahuna. You can read the full list in our article about massage chair brands we trust. We will be transparent and say that we are not familiar with the Ootori brand though. However, the good reviews and solid design are all plus points for the brand. We will be keeping an eye on Ootori. The Ootori A-600 is ideal for those looking for a budget chair no higher than a thousand bucks. If you are a family with many members who love a massage, or a single person who has lots of visitors at home, then this model is highly recommended because of how accommodating it is to different body shapes – whether you are tall, lean, or on the big side. We’d caution you though because we are unfamiliar with the brand. Still, take into consideration the glowing reviews from satisfied customers who have bought this chair.